How I Keep Everything So… White! 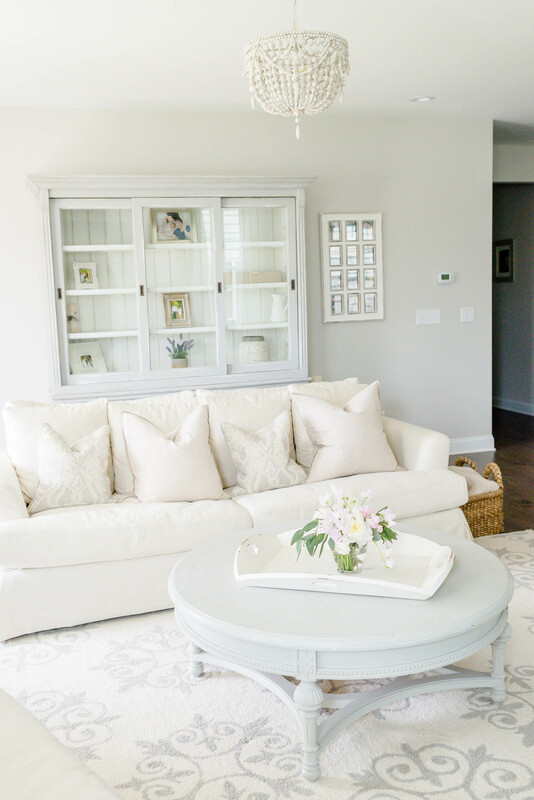 The question I am asked most often is, “How do you keep your house so white and clean! ?” Especially with a 3.5 year old boy and 6 month old baby girl, most people are shocked at my decor choices. The truth is that it’s actually not that hard! 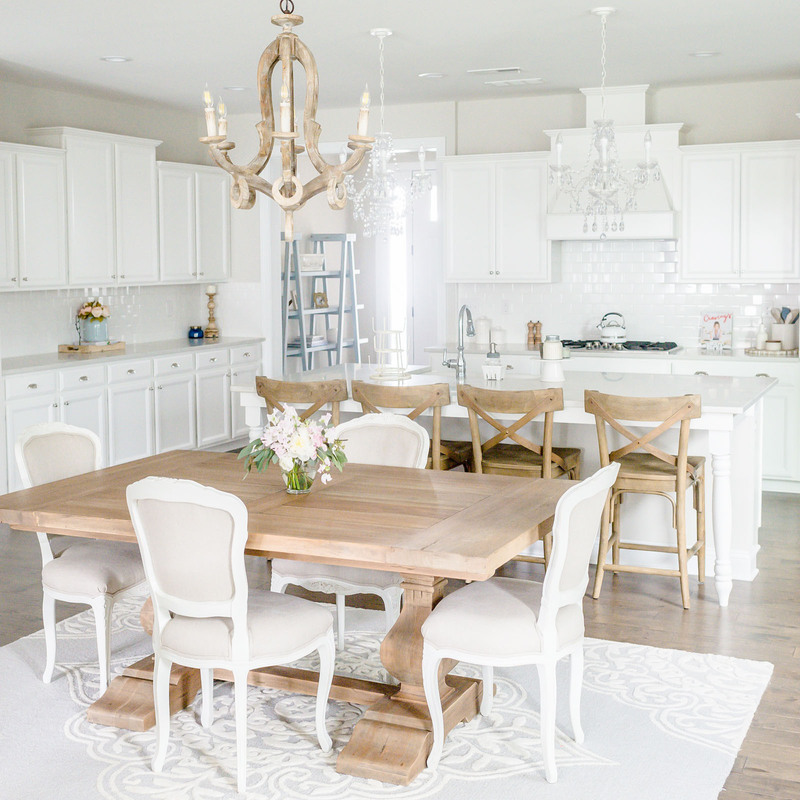 I wanted to share a few little tips for those with kiddos, pets, or even just a husband (haha) so that more of you can have the lucious white decor that we all love! Narrowing these down wasn’t easy but these are my “if I was stranded on an Island and had to have these things for my “White House” they would be… list. 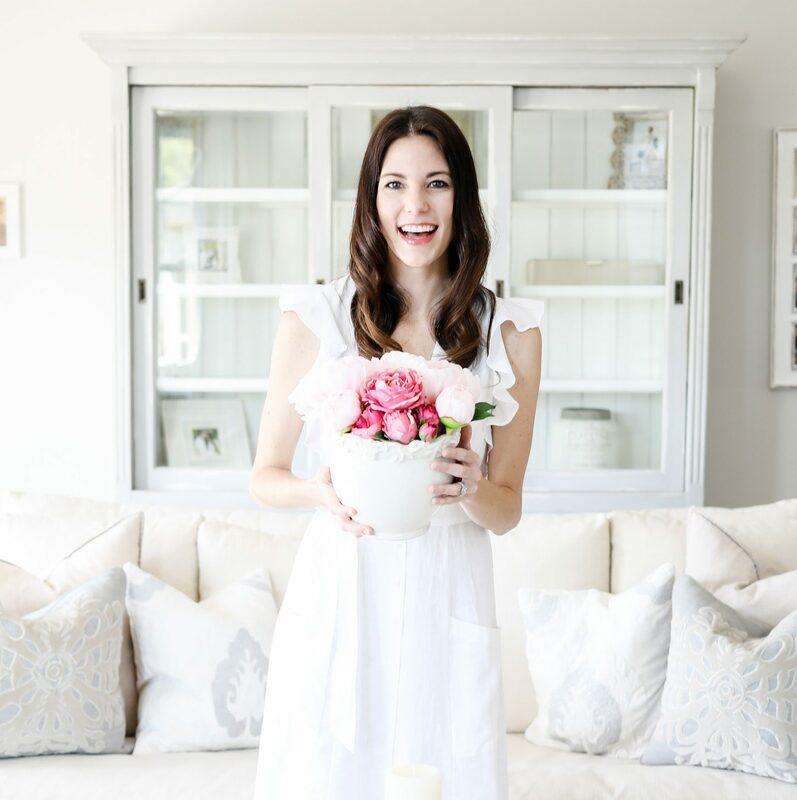 I feel like of all things these help keep my house looking bright, white, clean and organized! I love over sized baskets and storage baskets to keep things looking clean and simple. Crate and Barrel has some great options here. If you’re looking for a little more bang for your buck, my go to is Overstock for most home decor and organization. They have an amazing selection of baskets with endless options here! For toys, blankets, or miscellaneous items, I use baskets everywhere! My must have toy room organization piece is this! I have two and they are a game changer! Another important thing I do especially with kids is keeping crafts organized and UP HIGH! That goes for markers, pens, paints, or anything that can be used to mark up furniture or the walls. I love using mason jars and metal buckets to organize arts and crafts! 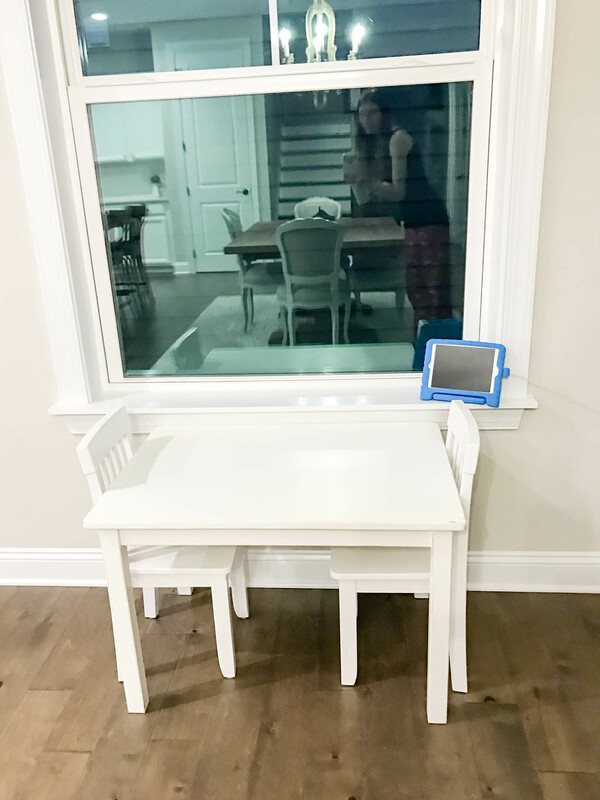 I have these two amazing organizers (here and here) and I’ve also rounded up my favorites for all around organizing. These wall mounts are great and can be put even in a closet or laundry room. Kids are still kids no matter what. We have a rule of no shoes on the couch but I don’t have a no shoes in the house rule. Even with adults, carpets get dirty and worn out. My favorite thing for carpet cleaning and keeping them looking bright and clean is my Bissell carpet cleaner. Everett surprised me with it from Costco and it is by far my favorite thing for carpets and rugs! Easy to use and just like vacuuming but it steam cleans your upholstery, car seats, rugs, carpets, and other floor surfaces! I shared some top rated ones below and my favorite cleaners for them. I’d give up most things to have my Bissell! I’ll let you in on a little secret. The three times our couches or chairs got stains on them, it was from yours truly. Yup, ME! I am pretty confident in my little tips to mix toddlers with white. Rule one, no shoes on the furniture. You can climb it, jump on it, throw pillows everywhere, make forts, anything you wish, just without shoes. Second up, wipe hands after eating or crafts. 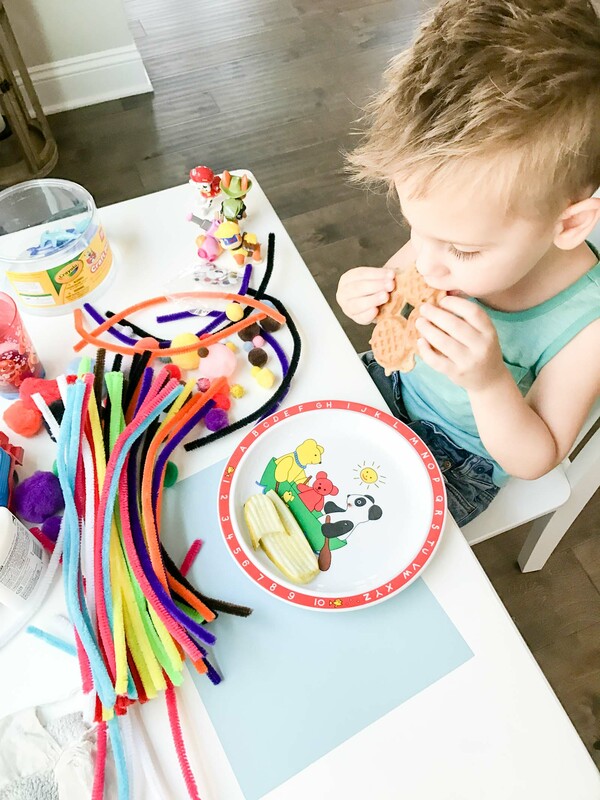 I keep these things at the kid table and that makes my life insanely easy and clean! My favorite/must have/can’t live without wipes are these because they work so well, have no chemicals AND as a major plus, wipe off the furniture and upholstery of small stains and it dries super quick! I have been using them for 3.5 years and won’t even try another brand! I highly recommend a kid area or table! This makes cleaning up easy and puts all the mess in one area 🙂 I have my table in light distressing so if it is banged up, it’s not noticeable! Remember, I keep the arts and crafts and anything like markers or pens up high. I bring them down and it’s a free for all at the table or floor by the table. Once food or craft time is done, wipe hands and run free! 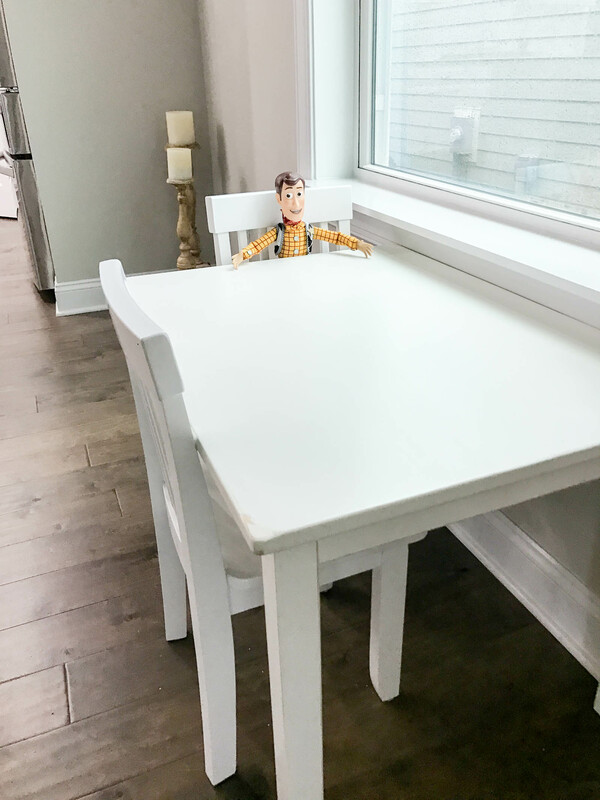 My son loves his table! We can sit at it with him, too! He was so excited when we got it and always asks if his baby sister is big enough to sit with him yet! I will be blogging about our upstairs soon and that is the “kid zone.” Of course toys and all that come downstairs but the playroom and most toy organization stays upstairs which allows for us to better maintain one area while making sure our babies have a place to go as crazy as they want! When decorating, remember, less can often times mean more! 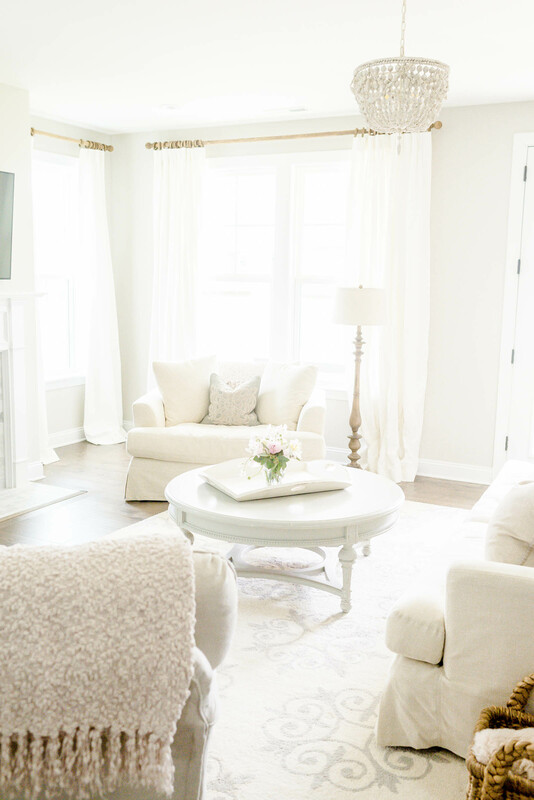 I love clean lines, soft colors, and changing up pillows often! You can add pops of color but one way to never get sick of your space is to change up easy things like pillows and blankets. My favorite style curtain are these beauties, and I love pillows with a little detail like this adorable pom pillow! Now you can go and enjoy all the whites and neutrals you have had your mind on! Where are your rugs from?! So pretty! What is the wall color in your living room? Looking for a good white! Thank you! It’s Sherwin Williams – Agreeable Grey! Where are your couches from? I’m looking for some good white couches which seem to be hard to find.